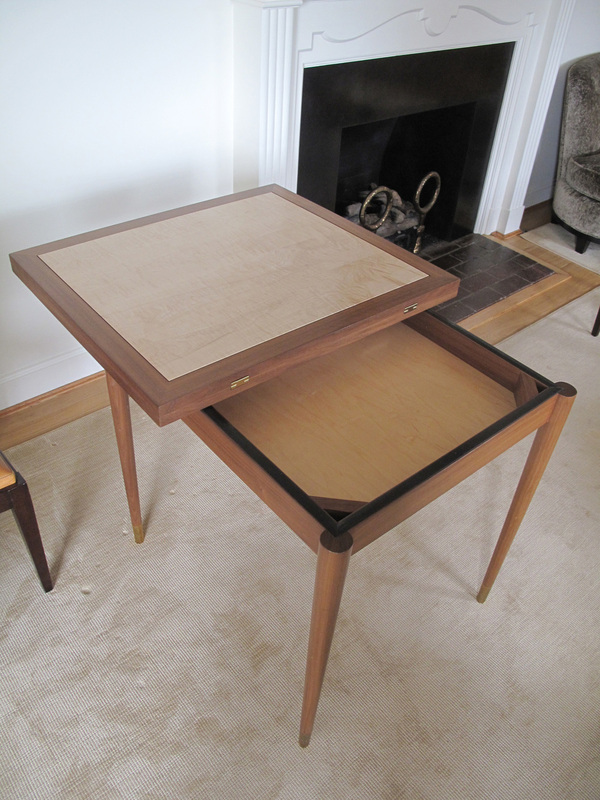 Denning Cabinetry built this table for a client who collects art extensively. She wanted a display piece for her home that matched the craftsmanship of her collection. This European Maple table is seventeen feet long and has concealed apertures for microphones and media display systems. A massive solid wood edge protects the decorative veneer center. This desk is one of a suite of custom desks built for an investment firm. The top is composed of an intricate pattern of Swiss Pearwood veneer with American Walnut inlay strips accenting the corners. In this project Denning Cabinetry's craftsmen used Western Curly Maple to construct a matched pair of bedroom night tables. The overall effect demonstrates Denning Cabinetry's painstaking attention to grain orientation. In addition to the night tables for this bedroom, Denning Cabinetry also constructed an upholstered bench in Western Curly Maple. Both projects utilized solid wood for the frames and bases and veneer for the larger areas. This construction provided durability and elegance--hallmarks of Denning Cabinetry's philosophy. This twenty-one foot dining table is actually a set of twelve tables that can be used individually or grouped together with specialized hardware. 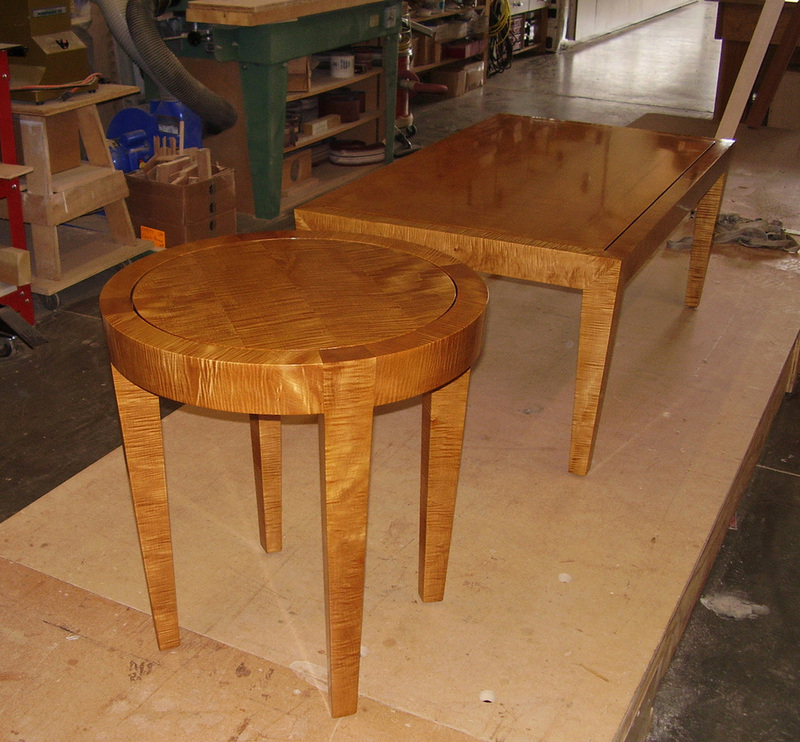 The table tops are made of book-matched Hawaiian Koa veneer rimmed with 2" thick solid Jatoba lumber. The two tables on the right are unfinished "insurance copies". When we are working with materials which are virtually irreplaceable because the veneers are from a single tree, we normally build an additional, matched, set to use if there are problems at any time from production to final delivery. 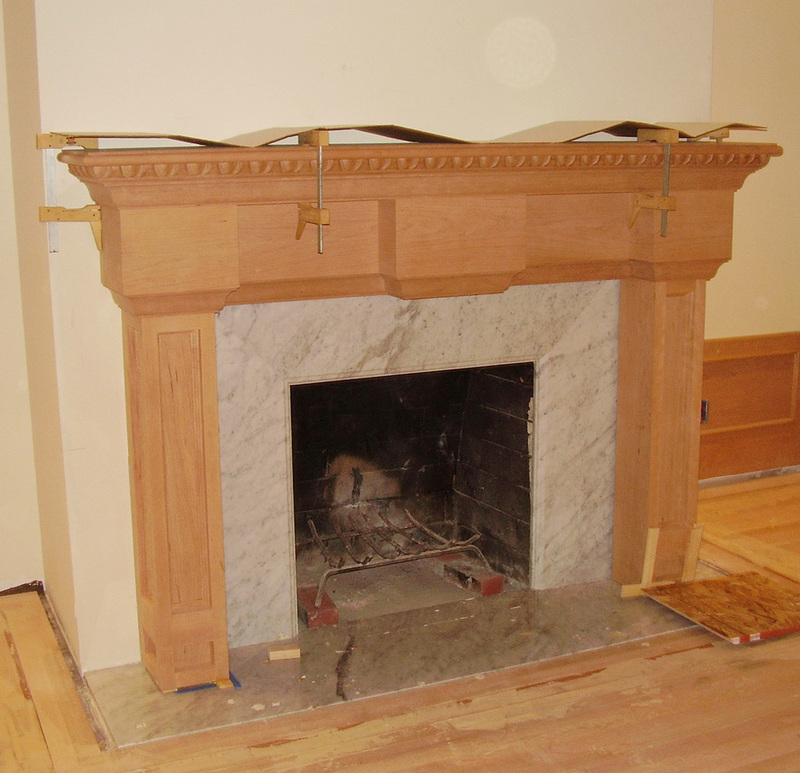 The man shown here fabricated this piece from start to finish. Also pictured is the trial assembly area in our shop. We pre-assemble all pieces at our shop to ensure a flawless assembly at the installation. Denning Cabinetry built this solid Anigre desk and wall mounted drawer unit for the home office of one of our clients. We milled the drawer handles from the same wood for a completely consistent finished product. 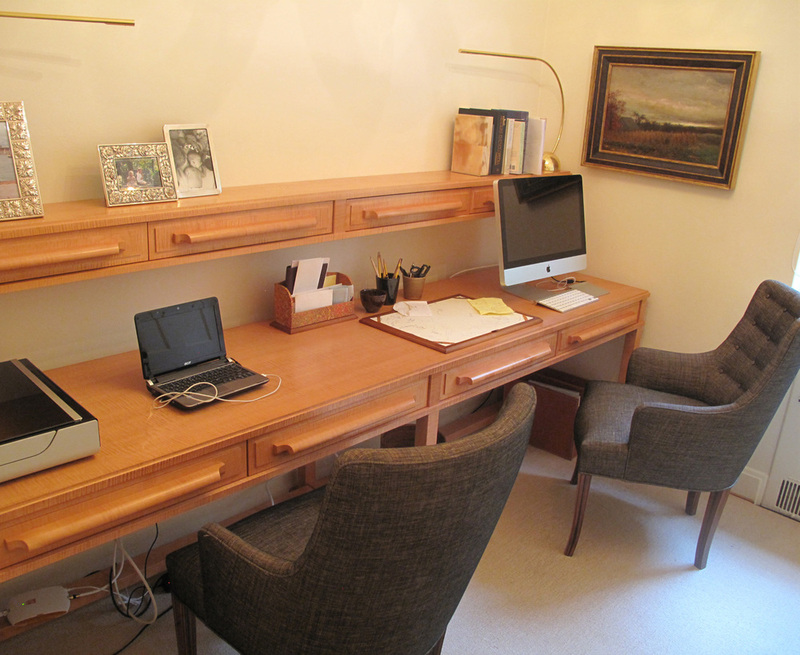 these pictures show the unfinished desk in the shop and the completed pieces in the clients' home office. These tables are all solid lumber from one tree. We purchased the entire trunk and used it to create a perfectly matched suite of furniture for a San Francisco residence. Denning Cabinetry built this unit in solid Walnut. With its decorative puzzle pattern, the cabinet houses the client's audio equipment. Denning Cabinetry worked with this client to build a piece that complemented the millwork in this historic home on San Francisco's Russian Hill. This progress shot gives a glimpse of the process of fitting the shop built fixture into the client's home. This suite of furniture utilized Walnut, Maple, Ash, and Anigre. The traditional British game table, shown here as it articulates into a large surface for the client's puzzle projects, was a challenge that one of our craftsman turned into a triumph of woodwork and engineering. The custom hardware for the pivot mechanism required precise positioning to make the top function properly. The Ash sunburst coffee table with Walnut frame is a beautiful example of veneer use mated to solid wood for durability. The solid Anigre partner's table with the wall-mounted upper drawer unit serves as the focal point of the home office. The mirrored Mahogany armoire complements antique chests in the master suite. We built multiple Anigre bookcases throughout the residence. The shelf adjustment system is inspired by French period pieces. Established in 1979, Denning Cabinetry has provided clients from coast to coast with custom cabinetry, furniture, and millwork of the highest quality. Our company prides itself on combining unwavering fidelity to the designer’s intent with time-honored craftsmanship.